In today’s contemporary dance scene, it seems pure dance works are hard to find. (By “pure dance” I am referring to works that simply utilize movement, not the idea discussed in my series of posts on Edward Hopper.) “Multi-disciplinary” is quite the buzz word with just about every discipline finding its way into the mix. Theater, puppetry, video projection, interactive technology – the sky’s the limit. Perhaps this phenomenon is not too surprising considering our technology-fueled, fast-paced, overloaded everyday lives in the 21st century. To be fair, I often enjoy such mixed works and feel, when used well, that multiple art sources can expand the potential for expression and make a work more interesting. In comparison, sometimes a work that is solely movement-based can seem flat, simple, and less impactful. In these circumstances, I have found myself wondering whether pure dance/movement can still be expressive, powerful, and relevant on its own. But then I turn to rare shows, like that of Word Dance Theater, as proof that this is indeed still possible. Weeks after the performance I can still vividly remember many images and snippets from the Duncan and Duncan-esque pieces. There was one solo in which the performer repeatedly drove her fist into the ground, each time with just as much passion and force, reaching her arms up to the heavens then driving it down again, seemingly weighted from within while also pulled into the earth. The movement was all so simple but the power, the emotion it conveyed was awe-inspiring. Throughout the entire show, I was absorbed by the emotion expressed and the universal themes portrayed through the movement. Just one strike of an arm or twinkle of an eye could convey power or hope, and works of just abstracted movement could illustrate complex ideas, like pathos, beauty, religion, and feminism. It reminded me that the body can often be more honest and tell so much more than words, thus making dance possibly one of the truest and most expressive art forms. In the same way that body language speaks volumes about a person’s feelings, the simple physicality of a dancer can convey any human emotion across the spectrum, often in as little as one move or posture. I hope we never forget the power and potential of pure dance. It is always good to stretch the art form and try new things, but let us not forget the ability of dance to stand alone, to captivate an audience, to engage viewers to their very bones and souls. And let us also remember the universality and timelessness of human emotions and experiences. I mean, I was watching old dances (1915, 1923, 1924, etc. ), but the ideas and meanings were just as relevant and poignant to me and the world today. 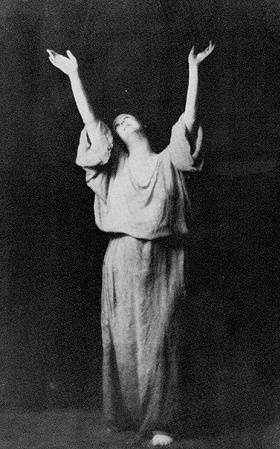 And so, I want to thank Isadora Duncan and Word Dance Theater for reminding me that pure dance is not dead at all and for making this multi-disciplinary favored viewer yearn for more simplicity.